February Passing of the Pioneers has obituaries from some of the Western District’s early colonists. They include Fanny Fisher and John Kelly, both born in Tasmania. They each lived in Victoria for 79 years by the time of their deaths. Alexander LEARMONTH: Died 8 February 1874 at Hamilton. The Learmonths were one of Hamilton’s most noted families. Alexander was the eldest of four brothers to immigrate to Australia and in time their paths led to Hamilton. Alexander arrived in 1857 and immediately took an interest in the town’s affairs. He founded the Hamilton municipality and was the first Mayor of the Borough, holding the office for six years. 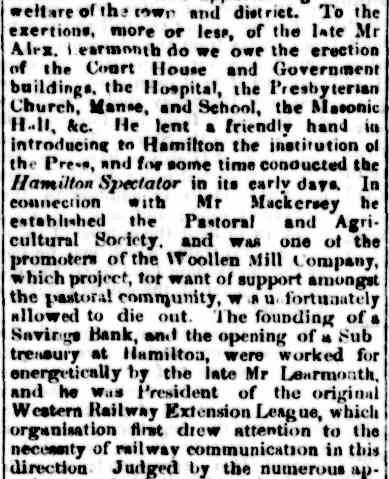 The contribution Alex Learmonth made to Hamilton in those early days was immense. Alexander was a trustee of the Hamilton Mechanics Institute. 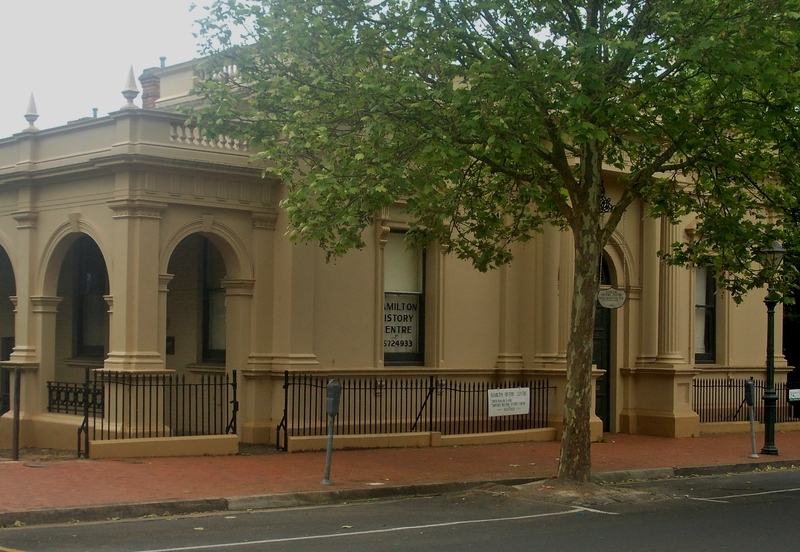 After his death, funds raised built an extra room named the Learmonth Memorial Hall. He also served as a territorial Magistrate, Coroner, Government Auditor and many other offices, too many to list, but all are in his full obituary. John KELLY: Died 7 February 1914 at St Helens. John Kelly, born in Tasmania, was one of the oldest residents in the Port Fairy and Yambuk district when he died in 1914. He had been in Victoria for seventy-nine years, having arrived aged three. He first resided at Casterton, then near Port Fairy and later he ran a general store at Yambuk. His wife passed away forty-one years before him and he left seven children. John Wishart GIBSON: Died 10 February 1914 at Colac. John Gibson was a Geelong importer before purchasing a large amount of land in and around Colac. He was a keen golfer and enjoyed playing the Port Fairy Golf Links on his summer holidays. John’s wife Grace signed the 1891 Women’s Suffrage Petition at Highton. They had five children. Fanny Mercer FISHER: Died 25 February 1914 at Dobie. Fanny Richardson was the oldest resident in the Ararat district at the time of her death, aged eighty-one. She had been in Victoria for seventy-nine years and that was also thought to qualify her as the oldest lady colonist in the state. Apparently she shared the title with a Mrs Pearman and a Mrs Creswick until they both passed away. Fanny, born in Tasmania, was the daughter of David Fisher. He took up the position of manager for the Derwent Company bringing him, and later his family, to Geelong in 1837. A letter from David appears in Letters from Victorian Pioneers. In 1850, Fanny married James Richardson. John Henry JACKSON: Died 2 February 1915 at Casterton. John Jackson was born in Longford, Tasmania in 1829. At fourteen, he travelled to Victoria to work for his uncles Samuel and William Jackson near Sunbury. When his uncles purchased Sandford Estate from John Henty in 1847, John rode from Sunbury to Sandford by himself aged eighteen. He remained there for the rest of his life. John married Marianne Bowtell in 1855 and they had two sons and three daughters. John was one of the earliest J.P.s in the area and was a Honourary Magistrate. John HOWELL: Died 17 February 1915 at Orford. John Howell was born in the Port Fairy district around 1843 to Irish parents. He selected land at Orford in 1867 and remained there until his death. He never married, and due to his thrift was a donor to many worthy causes. He left three brothers and five sisters. Reverend Mother Mary Josephine CLANCY: Died February, 1915 at sea. The Reverend Mother Josephine was one of the founding members of the Brigidine Convent in Ararat, arriving around 1888 from Ireland. With guidance from the much admired Mother Josephine, the convent school, was highly regarded. Marian College still operates today. Sadly, after a trip home to Ireland, Mother Josephine passed away on the ship during the return voyage. Hugh CAMERON: Died February 1934 at Drumborg. Born in Portland around 1855, Hugh Cameron moved around the Western District for several years, finally settling at Drumborg. He lived at Condah, Willaura, Telangatuk and Branxholme. He married Mary Cameron of Toorak and they had five boys and two girls. Ellen McDONALD: Died 4 February 1937 at Moonee Ponds. Ellen McDonald lived in Portland for most of her 76 years but moved to Moonee Ponds for the last thirteen years of her life. During her time in Portland, where her husband Thomas Hickey ran a livery stable, Ellen attended All Saints Church. After the move to Melbourne, Ellen enjoyed returning to Portland for her annual holiday. She left Thomas, five sons and two daughters. A son John, a veteran of the Boer War, predeceased her. Samuel ARTIS: Died February 1938 at Port Fairy. Samuel Artis was born around 1858 and worked for the Belfast and Koroit Steam Navigation Company for many years and was at one time, foreman of the wharf. Samuel was also an expert on the history of Port Fairy. Frederick H. BEST: Died 29 February 1940 at Winslow. Frederick was born in England in 1849 and arrived in Portland with his parents, in 1852. He began work as a tanner at fifteen and work around Australia and New Zealand for the following ten years. He married Louise Cardinal at Woolsthorpe in 1875 and set up a tannery business at Winslow. It became the biggest tannery outside the larger cities. William McKENZIE: Died 2 February 1949 at Newfields. Born at Carranballac Station in 1868, William McKenzie was the youngest of thirteen children. 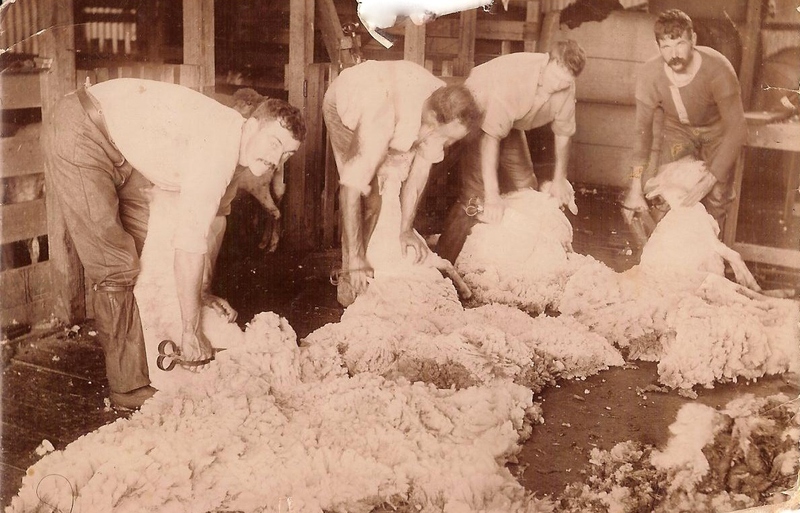 He worked as a shearer through the Western District and N.S.W. before taking up dairy farming around the turn of the century. William married Augusta Schmidt in 1896. This entry was posted in Pioneer Obituaries and tagged Artis, Best, Cameron, Fisher, Gibson, Hamilton, Hickey, Howell, Kirkwood, Learmonth, O'May, Port Fairy. Bookmark the permalink.